Chloe just couldn’t handle it anymore. After enduring almost eight years of relentless bullying, Chloe took her own life. Chloe’s story featured in an episode of 60 Minutes called Chloe’s Law. Throughout the episode, reporter Allison Langdon spoke to Chloe’s family and friends about what led their beloved Chloe to think she had no other other option than to opt out of life. “I mean, I just wish that I could have said to her, just hold on, you know. Once you finish school, you know, it’s gonna be okay,” Chloe’s sister Cassie told Allison Langdon. “She felt she had no other escape. It breaks my heart that my kids are not gonna like, they’re – she’s not gonna see them grow up, ‘cause they just loved her so much,” Cassie said. Chloe was the youngest of six children. She wanted to be psychologist and work with children when she grew up. And when she was just seven years old, her mun passed away from breast cancer. One of the most tragic parts of this story is that Chloe’s mother’s death was one of the reasons the kids bullied Chloe at school. Chloe Fergusson was just like any other 15-year-old girl – she loved hanging out with her friends, talking about boys and she was always on Facebook. Like so many teenagers, Chloe knew what it meant to be bullied. For years she’d endured verbal and physical assaults but when Chloe went home and shut her bedroom door, the bullies were still there. Because the latest, possibly greatest, weapon in bullying is social media. For Chloe, the impact was devastating. Last month, she took her own life. It’s left her friends and family shattered and now her sister Cassie is on a one-woman crusade to make bullying a crime. The youngest of eight siblings, Chloe Fergusson, 15, suicided after she was relentlessly bullied physically, verbally and online. The worst of it started after her mother, Elizabeth, died in 2006. Chloe was called ugly, teased for not having a mother, thrown against lockers, called horrible names and socially excluded. After school it continued on social media. Chloe tried to brush it off, but the bullying affected her confidence. Things came to a head when a group of girls kicked and punched her after she got off the school bus, threatening to post footage of the attack on social media. Two days later she took her own life. Chloe’s family collected more than 48,000 signatures on a petition calling for federal crime laws to incorporate a legal definition of cyber-bullying and to regulate it. They wanted a specific offence of cyber-bullying created and to take all possible actions to regulate, prosecute and educate against bullying in all forms, particularly cyber-bullying. Children can now complain to a specific federal body if they are cyber-bullied. Passed in early 2015, the Enhancing Online Safety for Children Act established a Children’s eSafety Commissioner, a complaints system for reporting cyber-bullying material aimed at an Australian child and a two-tiered system for rapid removal of cyber-bullying material from large social-media services. The Children’s eSafety Commissioner is an independent statutory office within the Australian Communications and Media Authority to administer cyber-bullying complaints. The commissioner will also promote children’s online safety, co-ordinate relevant Commonwealth department, authority and agency activities, conduct, accredit and evaluate educational and community awareness programs, make grants and advise the Communications Minister. A child or their parent/guardian can lodge a complaint to the commissioner if they have reported the material to the specific social-media site first and did not receive an outcome. The commissioner will have the power to investigate complaints into cyber-bullying and conduct investigations as he or she sees fit. mamamia.com.au – Chloe Fergusson should still be alive. 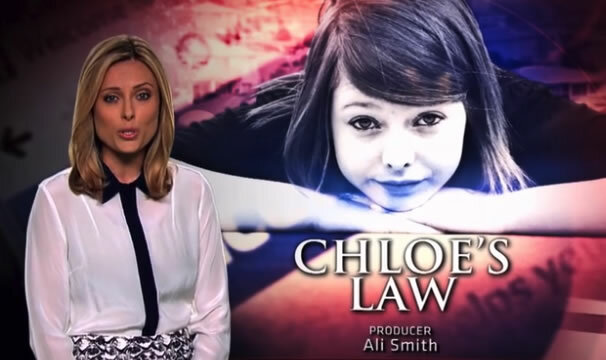 Please note: Chloe’s Law was ABC’s very first post in 2013. In 2018, we discovered it had vanished without explanation. The content above was recreated in May 2018.